GPS recently named Joseph (Joe) Dalessandro as the Information Security Leadership program chair. In this new role, Dalessandro, who previously served as an instructor in the program, will recruit and mentor faculty, oversee course quality, and advise students on program and course requirements. 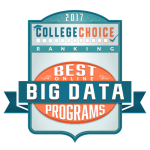 Brandeis University’s MS in Strategic Analytics program ranked 28th on College Choice’s list of the 50 Best Big Data Degrees for 2017. 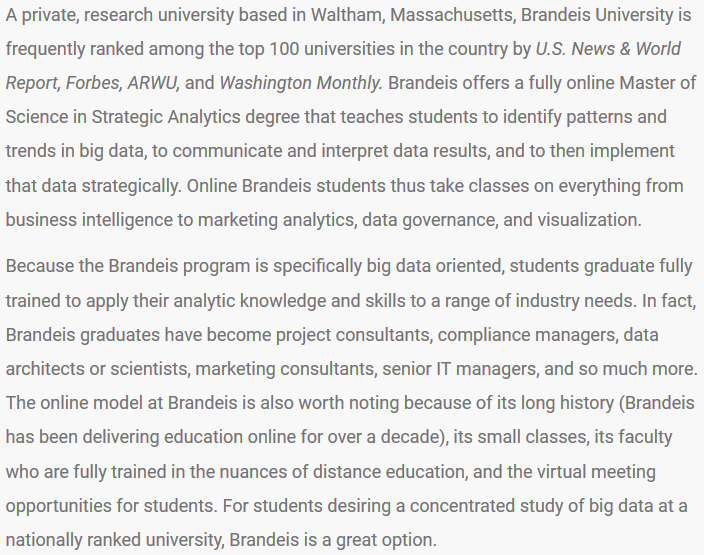 View College Choice’s full list of schools here, and click here to learn more about Strategic Analytics at Brandeis. The Healthcare Information and Management Systems Society (HIMSS) will award GPS Health and Medical Informatics student Jill Shuemaker with the Richard P. Covert, PhD, LFHIMSS Scholarship for Management Systems, a national award recognizing her contributions to the field of health and information technology in 2016. The award coincides with Shuemaker’s emergence as a national expert in health and medical informatics. As a registered nurse with Virginia Commonwealth University Health System, Shuemaker developed a patient-centered, analytic, teamwork-based approach that single-handedly ensures her organization’s electronic quality measure program fully meets federal regulatory requirements. She also advocates on a national level for advancing patient care through sound measurement design, implementation of quality program changes and vendor accountability. Shuemaker is currently enrolled in the Health and Medical Informatics graduate program at Brandeis University’s division of Graduate Professional Studies. As a part-time, fully online student, Shuemaker continues to advance her career as she works to improve and transform the healthcare industry. 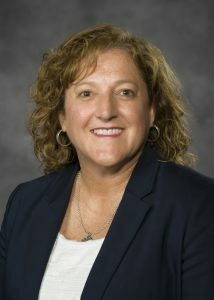 In addition to her work as an RN, Shuemaker is a Certified Professional in Health Information Management Systems (CPHIMS) and Co-Chair of HIMSS National Quality and Safety Committee, where she interacts directly with clinicians, technical staff, and even federal officials on a routine basis. 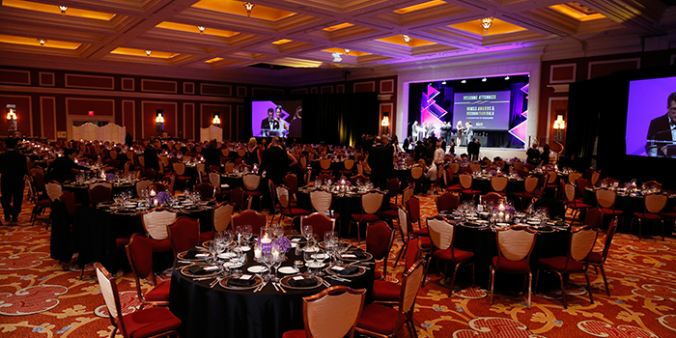 She will officially receive her award later this month at the HIMSS annual Awards Gala in Orlando, Florida. Brandeis University’s Graduate Professional Studies division (GPS) is dedicated to bringing an exceptional graduate education experience to adult learners across the country and the world. The division’s catalog of 12 fully online, part-time master’s degrees and certificates represents today’s most innovative industries, offering students opportunities to advance in management, technology, data informatics, marketing and other fields. With small classes, a convenient and flexible approach to online learning, and faculty who are leaders in their industries, GPS fosters a community that is mindful of its students’ professional, academic and personal commitments. As a leading research university and member of the prestigious Association of American Universities, Brandeis fosters self-motivated, curious students ready to engage new experiences and global endeavors. The university is widely recognized for the excellence of its teaching, the quality and diversity of its student body and the outstanding research of its faculty. 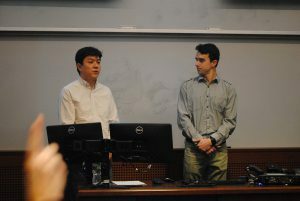 Brandeis Bioinformatics student Donald Son and his team of entrepreneurs took third place in last Sunday’s university-wide SPARKTank competition, an annual live-pitch event hosted by Brandeis Innovation. Competing against 12 other groups seeking seed funding to bring their startups to market, Son’s team received $10,000 to further their work on Green Herb Analytics (HerbDx). The California-based facility uses analytical chemistry, software integration and medicinal cannabinoid biology to provide quality assurance lab testing and ensure that the product entering the market is safe for human consumption. The startup also seeks to establish an innovative, cutting-edge brand with affordable prices. While Son himself does not use cannabis, he has a personal connection to unregulated supplements and medicines and their impact on public health. HerbDx plans to put its seed funding toward a small lab space, a mass spectrometer to optimize pesticide testing, and to advance production and marketing efforts. Outreach efforts will include an increased digital and social media presence, partnerships with special interest groups, and visibility at trade shows and conferences. SPARKTank is a live pitch event where Brandeis entrepreneurs compete for seed funding in front of a live audience. 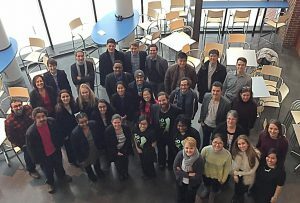 Thirteen teams comprised of Brandeis students, faculty and staff pitched their innovative ideas to a panel of industry judges with the hopes of receiving a portion of the $50,000 grant pool. The pitches included startups, technologies and entrepreneurial ventures, which demonstrated the extensive breadth of entrepreneurial spirit at Brandeis University. Students who are earning their master’s degrees while also working full-time have a lot on their plates, and often not a lot of room in their bags. Between laptops, tablets, take-home work assignments or text books, having everything you need to transition from a working professional to an adult learner and back again can be, well…a literal weight on your shoulders. Luckily for us, it’s 2017, and there’s an app for that. Here’s a list of our favorite tools that can studying at work, at home, during your commute, or anywhere in between a little bit easier. Tiny Scanner Enjoy taking notes on paper, but don’t want to carry your book or notepad along with you? Tiny Scanner allows you to take a picture of any sheet of paper and easily convert it into a PDF to email to yourself. Carry your work with you wherever you go, and don’t lug around more than you have to. RefME Need some citation help with that research paper? With RefME, you can choose from over 7,500 citation styles, scan the barcode of your book or journal, and RefME automatically fills in the rest. Take some of the stress out of your assignments with this convenient tool. Google Drive Many of us use the desktop version of Google Drive to store our documents and study materials but can’t easily access these material on our smartphones. Download the Google Drive app and access your files on the go. Flashcards+ Do you prefer to study with flashcards over your lunch break but keep forgetting to toss them in your briefcase? With Flashcards+, you can create custom-made flashcards and access them on the go. Never worry again about losing a card or two while you’re out and about. These virtual flashcards aren’t going anywhere. Scribd Create your own custom e-library and download all the books and texts you need. Graphing Calculator Forget about carrying around your old TI-84. Graphing Calculator handles more complicated data sets than the standard smartphone calculator. Pandora– Working in a loud space and need some music to put you in your own world? Tip: classical music helps many people focus in a loud space. 1Password– Keep your passwords all in one place with the secure and convenient 1Password app. You’ll save yourself time and effort and you’ll never have to go through the “forgot my password” process again. Microsoft OneNote– Don’t want to carry around a notepad or notebook? Microsoft OneNote lets you take notes on your smartphone. With this app you can take notes, make to-do lists, and access these documents from anywhere by simply logging into your account. Did we leave one of your favorite apps off our list? Tweet your suggestions to @BrandeisGPS! Wayfair is looking for a User Experience design professional with a proven record of creating engaging experiences that foster repeat visitation. The ideal candidate is self-directed, analytical, and creative. Executing interactive design and informing visual design as part of a multi-disciplinary team, the perfect candidate researches UX design trends and lives and breathes e-commerce best practices. At the end of the day, we want natural shoppers with the ability to dive into the customer mindset. 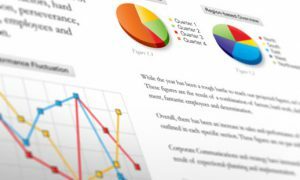 Conduct research using various qualitative and quantitative methods. This includes first person and remote research. To receive full consideration for this position, candidates are asked to submit an application on the Wayfair website. Please make sure to reference seeing this position through the Brandeis GPS job spotlight post. 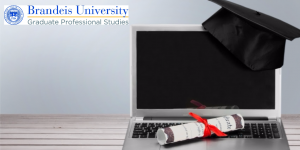 Online master’s degrees at accredited universities have become increasingly popular over recent years. Many programs, like the ones offered at Brandeis GPS, cater to professionals who are working full time and are seeking a degree to move the needle on their career. Truly asynchronous programs – where students aren’t required to log into a class at a certain time – allow students to set their own schedule when it comes to their academic study. But for some online learners, the lack of structure can be a challenge. Below are some tips to help you achieve the perfect work-life-school balance while pursuing an online degree. Schedule your school time just like you would schedule an appointment or meeting. Consistency can be key. And don’t forget to get creative with your study time. Have a long train ride as part of your commute? Take care of your weekly readings while you ride. Drive to work? See if your text book has an audio version and listen in the car. Find a regular time to do your coursework, and soon it will become a part of your daily routine. Ask yourself when you are most productive. Perhaps it’s on that long train ride where you easily focus. Are you most productive on Sunday afternoons while sitting in your local library? Do you enjoy staying in your pajamas and doing work from your kitchen table? There is no right answer as everyone has different zones of productivity. Make sure the space where you want to work is available and distraction-free in advance. You will get everything done a lot faster if you go in knowing this is your time and place for coursework. If you have an assignment deadline approaching, you may be tempted to come home after a long day of work and open your computer to get your schoolwork done as quickly as you can. Don’t do that – you want to put your best foot forward! Separate your job from your coursework, take some time to relax, go to the gym, or eat a snack. Keep your brain power focused on what you’re doing so you can achieve results that make you proud. In an online classroom, it is easy to keep quiet and only participate when necessary. Don’t take that approach: you’re here to learn, after all! Schools like GPS intentionally offer small classes to foster engagement and collaboration among your peers and instructors. Stay tuned for more tips on how to be a productive online student, and don’t forget to reach out to your advisor or instructor for guidance.